Last updatit on: 6 Julie 2013. Marion Bartoli (born 2 October 1984) is a tap-10 French professional tennis player an the current French no. 1 (oot o five French players in the tap 100). She haes wan ane singles major (Wimbledon), seven ither Weemen's Tennis Association singles titles an three doubles titles. She wan the 2013 Wimbledon Championships efter previously bein runner-up in 2007, an wis a semi-finalist at the 2011 French Open.She annoonced her retirement frae professional tennis on 14 August 2013. Bartoli haes defeatit three reignin warld no. 1 players in her career so far. She defeatit Justine Henin in the semifinal o the 2007 Wimbledon Championships, Jelena Janković in the fowert roond o the 2009 Australian Open, an Victoria Azarenka in the quarterfinals of the 2012 Sony Ericsson Open. She haes an aa recordit wins ower ither tap players such as Venus an Serena Williams, Ana Ivanovic, Lindsay Davenport, Arantxa Sánchez Vicario, Dinara Safina, Caroline Wozniacki, Petra Kvitová, Samantha Stosur an Kim Clijsters. She is kent for her unorthodox style o play uisin twa haunds on baith her forehaund an backhaund. On 30 Januar 2012 she reached a career heich rankin o no. 7 in the warld. 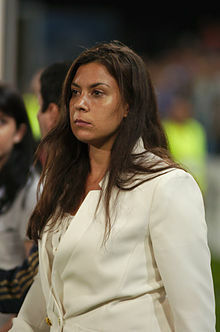 Bartoli haes reached at least the quarter-final stage at each o the fower Grand Slams. Her win at Wimbledon made her the saxt player in the open era tae win the Championships wioot droppin a set. This table is current through 2013 Wimbledon Championships. ↑ 1.0 1.1 1.2 "Marion Bartoli". Women's Tennis Association. Retrieved 8 July 2013. ↑ "wtatour.com -> Player profiles -> Marion Bartoli -> Stats". WTA. Retrieved 2011-01-07. This page wis last eeditit on 31 August 2015, at 03:24.